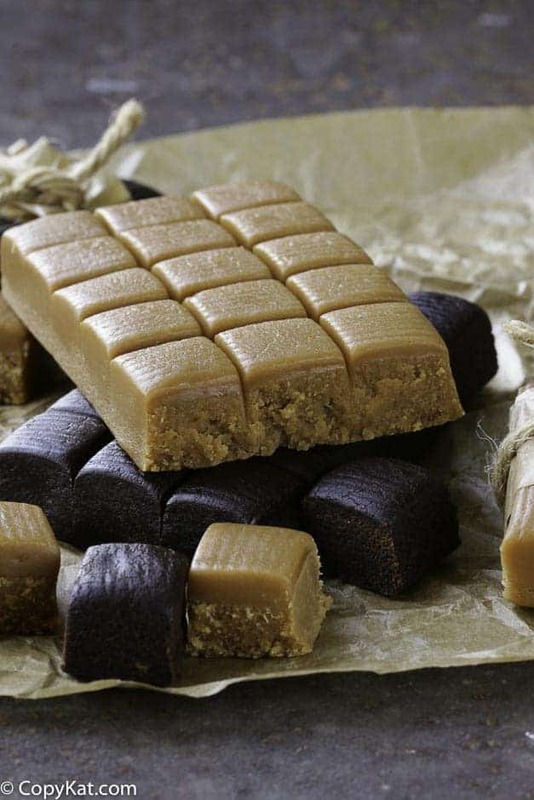 Fannie Mae Candy company has long been known for their creamy caramels. You can make these at home. These are soft and chewy delights. Butter a 9X13 baking pan. In heavy 6 quart Dutch oven, combine sugar, corn syrup, condensed milk, milk, cream and butter. Place over medium heat and stir occasionally with wooden spoon until comes to boil. Clip on candy thermometer. Cook stirring constantly until reaches 240 degrees or soft ball stage. Remove from heat. Stir in vanilla and nuts. Pour without scraping into pan. Allow to stand overnight. Cut into 1-inch rectangles or squares. Wrap in wax paper or dip in chocolate. I made these and could not get over the identical taste. This recipe makes about 110 pieces. A must have...must make recipe!! Fannie Mae is a Midwest northern household name. I am sure people will be pleased. I have been making these for years and you need to be patient and it can sometimes take over an hour for the right consistency and to get to soft ball stage. I find that once I reach soft ball, I then continue to cook and stir for another few minutes. This helps to not have them stick to the wax paper when I wrap. Every year I make these for Xmas to give as gifts to friends and they now expect them, LOL. I made these wonderful candies for the first time. They set overnight but the middles are still just a bit soft. Should I let them sit longer, put them in the frig or let it be? Putting them in the fridge will help them harden up a bit. Do you have recipe for Fannie mae dixies? Should the whipping cream be heavy or regular? What type of milk should be used? Whole? 2%? 1%? Or non fat? Looking fwd to making these tasty treats! I always use whole milk when cooking. My recipes are designed with whole milk in mind. Thank you. Are you at a higher altitude? Candy making takes a lot of time. I know when I make peanut brittle it can take about 35 to 40 minutes per batch. I am glad you enjoy the recipe. I cooked these at 240 for 15 min and still didn’t come out to caramel.. There is to much milk or condensed milk in these. The product is white gooey not cooked mess. I am sorry to hear these didn’t turn out well for you. I know sometimes candy making can be challenging. If the mixture is still juicy what am I doing wrong and what can I do to fix it!!??? Am I to put it in the fridge or leave it on counter top wrapped or unwrapped.. Please help.. I am going to guess maybe this didn’t reach up to proper temperature. Sometimes thermometers can be off. If you put it in the refrigerator it should have hardened somewhat. You can test your candy thermometer by putting it in boiling water. It should read 212 degrees. If not, either add or subtract the temp to make the adjustment. Can you make these without the nuts? How do you think these would come out if you put them in the small mini cupcake paper cups? I put fudge in them that works out fine. Do you think these would these be too sticky to come off of the paper cups? Just a thought for a better way. Will the recipe turn out if I don’t use nuts – allergies? 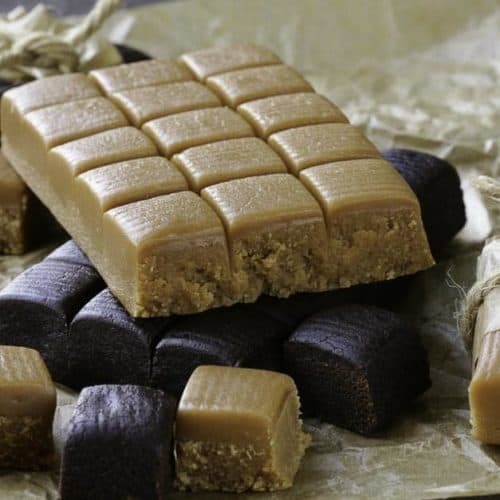 I MADE THE CARAMELS, WAITED OVER NIGHT AND THE TASTE WAS GOOD, BUT THE PRODUCT WAS SOUP?? ?i HAVE TWO DIFFERENT CANDY THERMOMETERS, I HAVE EXPERIENCE WITH CANDY MAKING, WHAT HAPPENED??? IS THE RECIPE CORRECT? The recipe is correct. I am sorry this happened to you. I am certain you have great candy making experience, and you do well with candies. I am sorry that they did not set up. This recipe does work, but it didn’t, maybe some tiny bit of water got in there and messed up the process. I wish I could give you a better answer. Again, I am very sorry you had a bad experience. MAYBE IT WAS TOO WARM WHERE YOU SET THEM. I have been making these for years. I line my 9×13 pan with non-stick foil that I can just lift out of the pan and peel off of the caramels. I have also found that a pizza cutter is an easy way to cut them. One of the best caramels I have ever ate. It was a big hit with everyone. Only problem was trying to get the slab out of the dish after the caramel was set up. I covered the caramels pieces with chocolate and added some nuts on top. Just need to know a better way of getting the slab out of the glass dish. you probably didn’t let them cool long enough. I make these every year, with the nut, and they are never stringy. And maybe you didn’t cut the pieces all of they way down. I made these…..even went to 245degrees because I wanted to ensure I would be able to wrap them individually. They were very difficult to cut and stringy when I tried to pull them apart. I did omit the nuts…..so my question is this: Is it supposed to be a very soft caramel? If so then the texture stands to reason. With the nuts it would stand up a litle better. Thanks…….